Ryan Gander, Things that mean things and things that look like they mean things, 2008. Video. The work consists of a work inside a work. 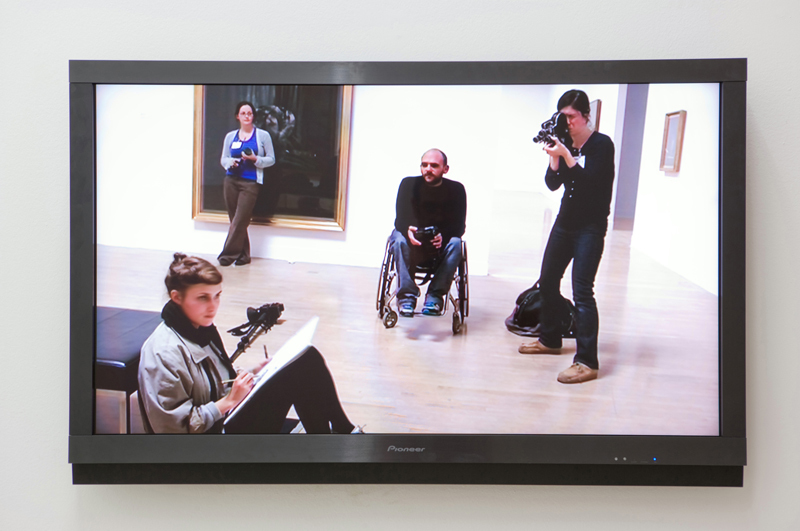 The spectator is presented with a commissioned documentary on a flat-screen Tv on the subject of the production of the making of an artwork that doesn’t exist entitled The magic and the meaning (2008). The imaginary film, The magic and the meaning, is described only within the documentary, which follows parts of the making of the film, extracts from interviews with the writer and film maker Dan Fox and the artist and maker of the work Ryan Gander; as well as showing short slow-motion sections of the film that does not exist. The imaginary film is described as taking the form of a 16 mm black and white film study of young art students in an exhibition of Francis Bacon at Tate Britain, London. The film documents the students drawing and sketching the paintings that they see on the walls in their sketchbooks, as an act of association to the world of art through a romantic gesture.